Andrea Boyd’s rise through the piping ranks in Nova Scotia has been nothing short of meteoric. From her first lessons at the age of eight, Andrea has demonstrated not only a high degree of musical talent, but a dedication to the many hours of practice and study needed to satisfy her desire to be the best piper she can be. Her first place finish in the ‘Targe’ March, Strathspey, and Reel event at the Highland Society of London’s Annual Solo Piping Competition on November 3rd is but the latest in a long string of competitive honours which have come her way. At home in Antigonish for the Christmas holidays, I had a chance to sit down and talk with her about her piping career. Andrea took her first lessons in 1992. Ed Neigh of Wellesley, Ontario, piping instructor at St. Francis Xavier University’s Scottish Folk Arts Summer School, remembers Andrea well. “She was so little,” he recalled, “her feet couldn’t reach the floor and she kept swinging them back and forth all through her lessons.” Madelyn Evans, who also taught Andrea at the summer school, remembers Andrea’s little fingers stretched to the limit to cover all the holes on the practice chanter, and her determination to do it right. That fall, Andrea started lessons with Valerie Cooke at the Antigonish Highland Society School of Piping and in February of 1994 joined the Antigonish Highland Society Pipe Band. Over the next few years she continued to study with Valerie and with John Walsh. She played in competition with the band for the first time in 1995, and was with them when they won the Grade 4 North American Pipe Band Championship in Maxville, Ontario. Andrea’s association with Bruce Gandy and the College of Piping led to her involvement with the Canadian Millennium Pipe Band, formed under the leadership of Pipe Major Iain Whitelaw. “Pipers from across the country were selected to take part,” Andrea says. “We were all sent the music, uniforms were ordered, and we got together for two weeks at the beginning of the summer of 1999 to rehearse and perform as a Grade 2 band. It was a great opportunity to meet other young Canadian pipers, and we had a lot of fun.” In the fall, Andrea joined the College of Piping Pipe Band but returned to the Antigonish Highland Society Pipe Band in the spring of 2001. During those formative years, Andrea moved up through the grades, winning numerous Champion Supreme awards for light music in Novice Juvenile, Grade 4 and Grade 2 as well as for both Junior and Senior Amateur Piobaireachd. Reaching Grade 1, the highest amateur grade, Andrea was soon displaying her winning abilities and was named the Champion Supreme for Atlantic Canada two years in a row. This honour, plus her ability as a piobaireachd player, brought her invitations to compete in the Nicol-Brown competition in Hartford, Connecticut and the George Sheriff Memorial competition in Hamilton, Ontario. 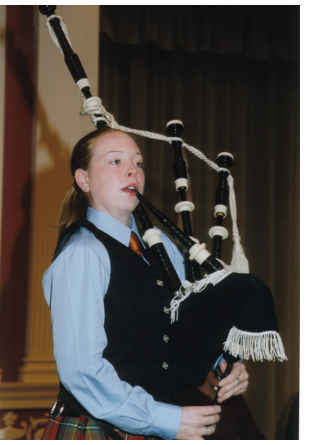 In 2000, she travelled to Scotland where she competed for the first time in the MacGregor Memorial Cup Piobaireachd Competition. 2001 was to be the banner year for Andrea, however. She continued her string of piping victories in Atlantic Canada and was named Amateur Piper of the Day at the Pictou County Indoor Meet, the Metropolitan Highland Games in Halifax, the New Brunswick Highland Games in Fredericton, and the Hector Festival in Pictou. She also won the Antigonish County Piper of the Day, the Allan Beaton Memorial Trophy for combined points in the Grade 1 March and Strathspey and Reel events, and the Jig event at the Antigonish Highland Games. These victories led to once again receiving four ACPBA Champion Supreme Awards, including Grade 1 March, Grade 1 Strathspey and Reel, Senior Amateur Jig, and Senior Amateur Piobaireachd. A graduate of the Dr. John High Gillis Regional High School in Antigonish, Andrea completed her competitive tour of Scotland and headed south to England where she is working for a year as a GAP Student at the Glebe House Preparatory School in Hunstanton, Norfolk. “The GAP program allows young high school graduates to travel to the UK and work as a volunteer for a year before entering university,” Andrea explains. “I had asked to be placed in Scotland, but was placed in Norfolk instead. Hunstanton is a small seaside village on what is called ‘The Wash’ (one of the kings of England dropped the crown jewels in the ocean there). Admiral Horatio Nelson was born nearby. Everywhere you go in England, there’s such a tremendous lot of history! “My school is what is called an independent school,” Andrea continues. “You might call it a private school here in Canada. It was originally a boys’ school, but about twenty years ago they began admitting girls. There is a Nursery program for children aged 6 months to 3 years, a Pre-Preparatory School of children aged 4 to 7, and the main Preparatory School for children aged 8 to 13. There are 160 students in all, with about 20 full-time boarders who stay from Monday to Friday and go home on the weekends. Others do flexi-boarding, which means they choose to board for one or two nights each week. All the students are from the area, though. The furthest away is probably less than 40 minutes. They board part time to get experience before going off to senior schools where they will stay full time, seven days a week. “The school day is so different than what kids experience here,” says Andrea. “The boarding students get up at 7 AM to wash and dress. I monitor their music practice from 7:30 to 8, and then we have breakfast. I supervise the arrival of the day students before classes begin at 9. We have assemblies in the Hall three mornings a week. Every student either goes to choir practice or to Bible Study. Grace is said at every meal, and you are taught how to use your knife, fork and spoon correctly. (Even to eat ice cream, you must use both your spoon and your fork.) The children are sorted into houses (St. Edmund’s, L’Estrange, and Barber’s). The students in each house take their meals together at an assigned table and they have house meetings. They are awarded stars by their teachers according to how well their work has been done, and every Thursday they count the stars. The children encourage each other to excel, and at the end of the year the house with the most stars wins the House Cup. (Did you think these things only happen at Harry Potter’s school, Hogwarts?) Afternoon tea is served at 4:15 and tea (supper) is served at 6 when the school day is over and the day students leave to go home. “It’s not all academics, though,” Andrea continues. “All students attend ‘games’ three days a week and play on house sports teams. Many of the students learn to play musical instruments or sing in the school choir, and there is a great deal of emphasis on the preparations for the annual Arts Festival at which the students of each house perform for thirty minutes - singing, dancing, reciting poetry. They do major musical plays in the winter term. The goal is to become a well-rounded individual. Andrea first met John Angus Smith at the Cowal Gathering in 2000. She met him again at Maxville in 2001 and arranged to study with him when she went to England. Because of the travel, She has only had four weekend sessions with him so far, and once he came north to Norfolk to teach her there. “It was not until I won the Targe that my Headmaster started taking my piping seriously. He’s since asked me to play at the school’s Remembrance Day Ceremony and for Robbie Burns’ Day,” Andrea says with a grin. Andrea returns to England at the end of December to finish her year as a GAP student at the Glebe House Preparatory School. She is hoping to be able to go north to Scotland for some of the summer competitions in 2002 but plans to be back in Antigonish by September when she will enroll in the Business program at St.FX University. She will, of course, continue with her piping. “It’s a major part of my life,” says Andrea, “and I’ve still got a lot to learn. I’m only just beginning to get the hang of it.” Some beginning!